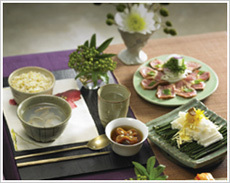 Dining is a very important part of Korean culture. People tend to eat with their families or with work colleagues and rarely eat alone. 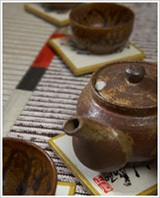 Due to Korea’s Confucian heritage there are many traditional customs that are still observed when dining. Below is an introduction to table etiquette in Korea. Although it is always a good idea to observe another country’s customs, travelers in Korea should not feel unduly concerned about dining etiquette. These days most Koreans are just happy to see foreign visitors taking an interest in their culture, and will not take offense if visitors do not observe all the customs. In Korean culture, respect for your elders is very important. Therefore, if you are dining with someone who is older than you, you should wait for them to sit and to start eating, and you should remain at the table until they have finished eating. When the food arrives, you should first taste the soup or the stew and then try the rice and the side dishes. Stews, soups, and meat dishes are often served in a large communal dish rather than individual servings. Koreans believe that sharing food from one bowl makes a relationship closer. Diners can eat directly from the main dish, or serve themselves into the small individual plates provided. When eating, Koreans are careful not to leave any traces of food on their spoon, and at the end of the meal, the chopsticks and spoon should be returned to their original position. Drinking can be an important part of doing business in Korea. The tradition is that you should never serve yourself, but someone else should fill your glass. If your fellow diner’s glass is empty, you should refill it, especially if you are drinking with someone older than you. When eating in a group in Korea, it is rare to share the bill or ‘go dutch’. Generally the older member of the group will pay the bill. Younger diners might try to repay the debt by paying for coffee afterwards. Unlike other Asian countries, Korean chopsticks are made from stainless steel. They are shorter in length than Chinese chopsticks, but longer in length than Japanese chopsticks. Korean chopsticks are often ornately decorated around the grip. At most restaurants, diners will be given chopsticks and a spoon. If visitors are uncomfortable eating with chopsticks, they should ask for a knife and fork. When dining at a restaurant, water or green tea is generally served free of charge with meals. At smaller establishments, visitors might be expected to help themselves to water from the water cooler. When drinking alcohol, separate glasses will be provided, and diners should not use their water glasses. Soju is drunk from a small glass resembling a shot glass, while Makgeolli (thick rice beer) is generally served in a small bowl. Traditionally when dining, Koreans sit on cushions on the floor and eat from a low table. The floor is generally heated by the ondol under floor heating system, so it is comfortable. This custom is still common at a lot of restaurants in Korea. The dining area in a restaurant is generally on a raised platform, which visitors should remove their shoes before stepping on to. These days most restaurants also have a table-and-chairs option in case visitors feel uncomfortable sitting on the floor.